What do we mean when we call an event “tragic”? When we do so, often without knowing it, we reach back to a form of theater that began over 2500 years ago, in 5th B.C.E Athens. This is perhaps the most powerful example of how a literary genre – tragedy – can shape our perceptions of our history and experience. 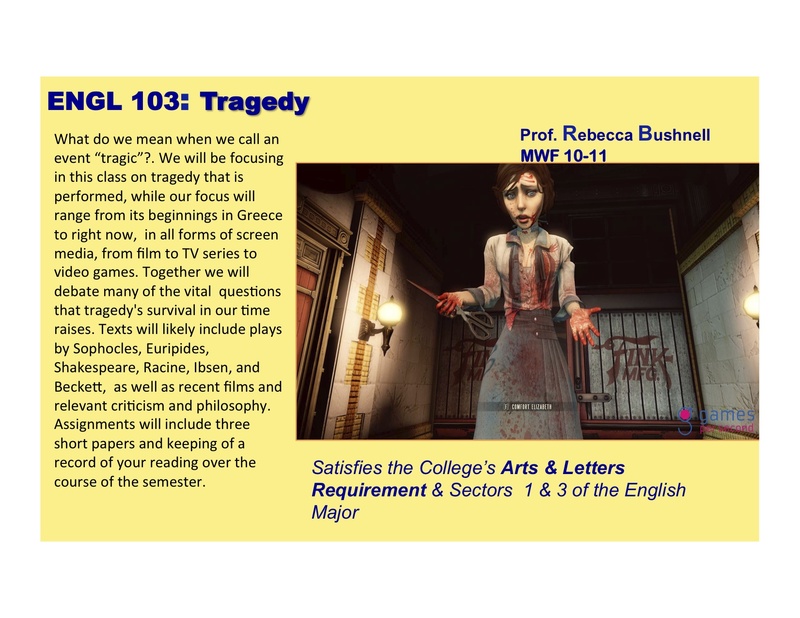 We will be focusing in this class on tragedy that is performed, while our focus will range from its beginnings in Greece to right now, in all forms of screen media, from film to TV series to video games. Together we will debate many of the vital questions that tragedy's survival in our time raises. For example, why do human beings feel compelled to stage and watch the imitation of human suffering? What is a tragic hero, and why and how do these heroes matter to people? Do tragic plots imply we have no freedom in determining the shape of our lives? This course will not pretend to cover all the manifestations of tragic drama from the Greeks to the present: texts will likely include plays by Sophocles, Euripides, Shakespeare, Racine, Ibsen, and Beckett, as well as recent films and relevant criticism and philosophy. Assignments will include three short papers and keeping of a record of your reading over the course of the semester.